Fund Your Film is our own film fundraising platform for our fiscally sponsored documentary, feature, short films, or web series. Created in conjunction with non-profit funding specialists Network for Good, it provides many advantages to help you increase donations to our projects. It will also help filmmakers keep more of what they raise. 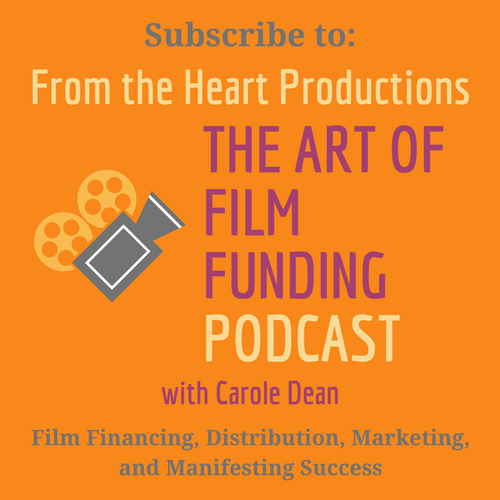 What’s So Special About Fund Your Film? You can set up and customize your own project page. You can add video, pictures, call to actions, a description and info about the filmmakers. Each page has its own unique web address that you can send out to donors as well as include in emails and outreach efforts. Your donors can pay all your fees. Donors will have the option to pay your 7% fiscal sponsor fee at the time of completing their donation. Over 74% of donors chose to contribute. If a donor chooses to share his or her donation details, that info will be published on your page. Donors can easily set up recurring donations to your project. A running total of how much your project has raised to date can be added to your page. Pages are optimized for mobile. 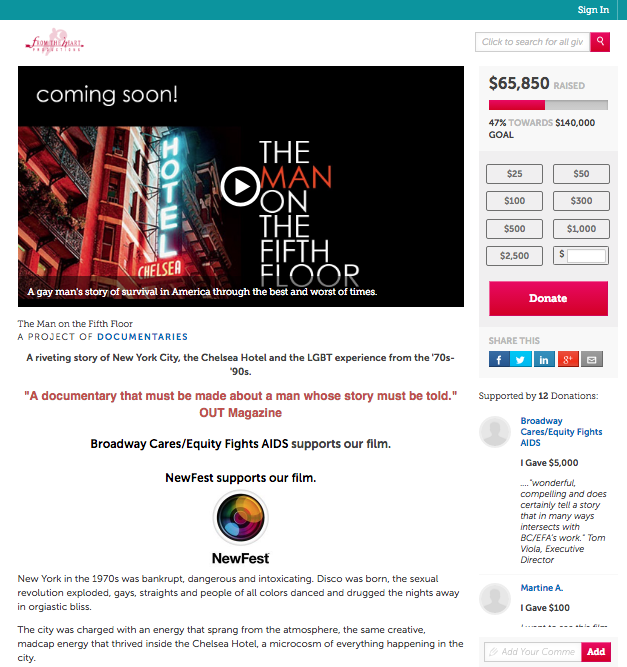 Films on platform are fiscally sponsored by From the Heart and give donors tax deductions for their donations. (Click screenshot image to view live page). STEP 1: Apply for Fiscal Sponsorship. Fiscal Sponsorship for your project is required before your fundraising page can be published. Your application and signed contract must be on file with us before we can approve your page. STEP 2: Read the fundraising page Setup Instructions (IMPORTANT). Please do not proceed until you have read the instructions completely. Also see the Fund Your Film FAQ, where many common questions are answered. STEP 3: Create your fundraising page. STEP 4: Submit your page to us for approval. Administration at From The Heart will be notified automatically after you click Submit. Someone will review the page quickly, offer suggestions if needed, and then, as long as your Fiscal Sponsorship Application and signed Contract have been received and processed, your fundraising page will be approved. You can start raising money immediately. STEP 5: Share your page. You will receive an email notification that your page was approved. You can now start accepting donations. The email notification will include the page’s URL, along with instructions to create a “Donate” button on your website, emails, or other marketing materials. The Donate button should link to your fundraising page. If you get stuck in the fundraising page setup process, please refer back to the page Setup Instructions before emailing us. Answers to Frequently Asked Questions are included in the instructions. If you need to edit your page, sign in to your Fund Your Film account, select your project, make your edits, and click “Save and Preview”. Already Have Fiscal Sponsorship with From the Heart? Then you can get started right away with Step 2 above. Donations received for a project from the 1st through the 15th are paid by the 23rd of the month. Donations received from the 15th through the end of the month are paid by the 8th of the next month. Founded by tech giants AOL, Cisco, and Yahoo, Network for Good brings unprecedented insight and experience to individual fundraising for non-profits. Their technology makes it possible to give to any charity, anywhere, anytime online. They spent years developing this site using “donor psychology” to maximize its fund raising potential. Non-profits using their platform have raised billions of dollars. Network for Good estimates that projects using this platform increase their donations by 40%. Carole Dean, president of From the Heart Productions, recently did an interview with Caryn Stein, Network for Good’s Vice President of Communications and Content, in which they discussed all of the benefits including those not mentioned. You can access it here at How to Increase Donations for Docs and Features. or call us at 805-984-0098.